Christopher Paul Stelling has quickly become one of my very favourite folk singers from the last decade. The American already recorded a session for The Influences some years ago and when he and his band were around last year, we got them into a studio and filmed this new one. It includes a mindblowing rendition of a traditional song ánd his own unreleased Oblivion. 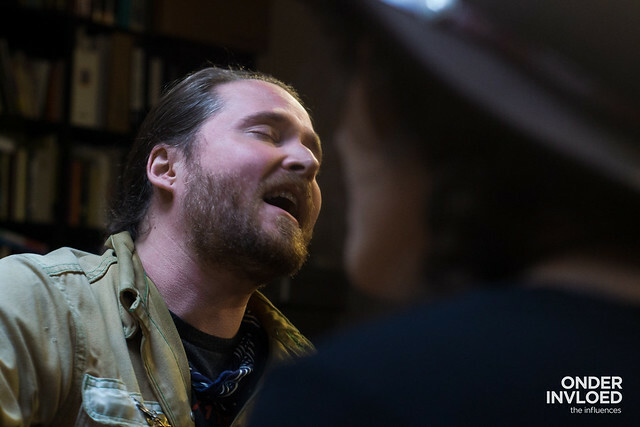 Christopher Paul Stelling will perform live at the next Onder Invloed show at Café de Stad in Utrecht, on Sunday May 6th. It’s a double-bill with the equally impressive Tom Brosseau. Get your tickets here and now. Stelling wrote a note before getting on his plane to Europe for his upcoming tour. You should read it, so I’ve done a little copying and pasting below. After touring nonstop for five years, I recently took a break of four months, and it seemed like an eternity. In those five years I kept such a pace – rarely if ever coming up for air. I finally had the life that I had always dreamt of: travel, adventure, music, and freedom… I couldn’t give it up, I couldn’t let it go. I was exhausted though, and I had to trust that if I slowed my pace it all wouldn’t just disappear. At times it felt like I was trying to hold water in my hands. Four albums in and well over a thousand shows…Finally though, I was able to look back, take a breath, and appreciate my good fortune. My last record Itinerant Arias was heavy and emotional in substance. At the time of its creation it really felt like the world was falling apart, and maybe it still is, but I know we won’t let it. All I can do is to keep going; renewed and with the benefit of my experiences. I’m far from wise, but I AM extremely grateful. I’ve been given this gift to be able to share my thoughts and music with people, and that’s what I’m going to do. This new Spring 2018 tour of Europe is going to be special. If it’s any indication, the tour that just ended of the eastern US was my favorite tour yet. I’m working on new material, and approaching the older songs with renewed verve. I’m telling stories from my times on the road, and looking forward to catching up with my friends new and old across Europe who give me the strength and encouragement that it takes to make this whole insane adventure possible.